Edward Enninful's first cover for British Vogue is beyond stunning. Model and activist Adwoa Aboah is beautifully captured by Photographer Steven Meisel wearing Marc Jacobs and make up by Pat McGrath. Upon seeing the cover I knew that this was something I needed to capture, and I'm so glad I took the time to illustrate this. Other fashion Illustrators were inspired also and it wasn't long before British Vogue noticed the work that was being published on Instagram. British Vogue reached out the next day and asked if they could have my permission to showcase my work for an online video. You can take a peek at my work and others on the video below. I true moment in fashion and I am beyond thrilled to be featured on VOGUE!!! I'm so excited to share with you all the launch of my new JAMES NEW YORK print. I partnered with Jetsetter and New York model James New York to create this graphic illustration inspired by Summer days in The Hamptons. There is a limited run of only 25, so order yours fast HERE. Watch this video for behind the scenes footage on the creation of this new print with James. My JetSetter Life Palm Springs, is very slowly coming together and in preperation two new prints have just landed in the store - Avalon Palm Springs (inspired by the Avalon Hotel) and Pass the Lotion. Hey Jetsetters! We are starting the Holiday season early with 30% OFF all MJSL Merchandise! Hurry and get a jump start on gift giving this season, or just "Treat Yo Self." Use code SAVE30 at checkout. 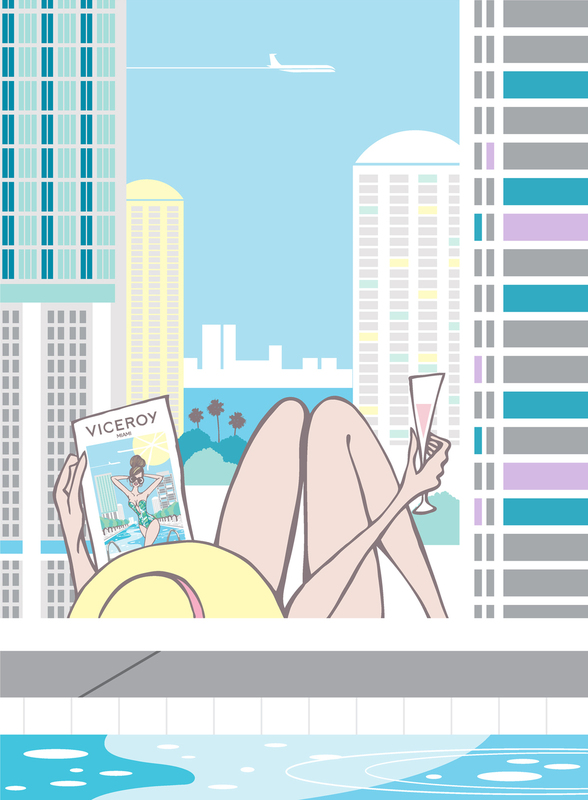 For those that may have missed the completed Viceroy project which I worked on last Summer, here are the final illustrations that were used in their "Some Like it Hot" Summer campaign. I've also included some photo's which were taken outside the entrance of the hotel and in the Restaurant 15th and Vine where four of the pieces were enlarged onto columns.